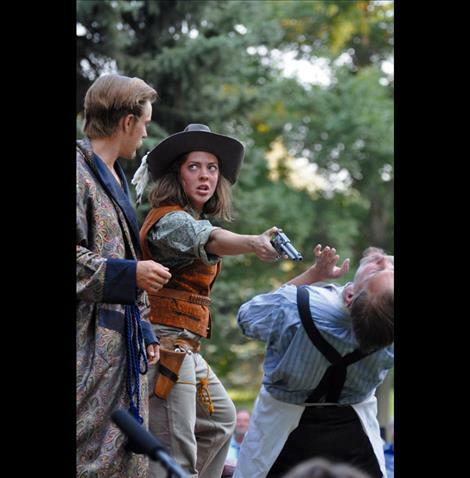 A man is held at gunpoint by Grumia during a performance of the Taming of the Shrew held in Palmer Park. 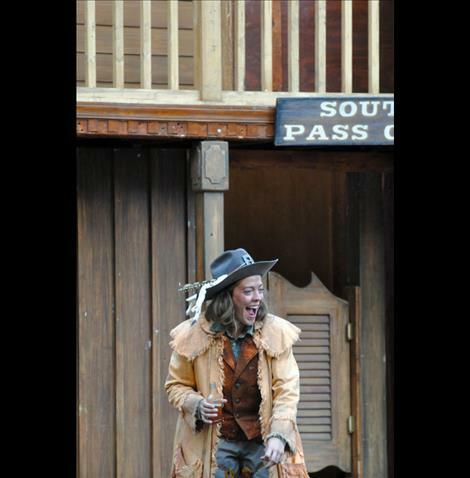 Bianca laughs as a suitor woos her. 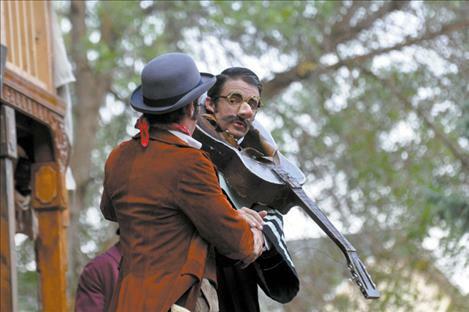 A head through a guitar is what one suitor for Katharina gets while trying to court the sister. 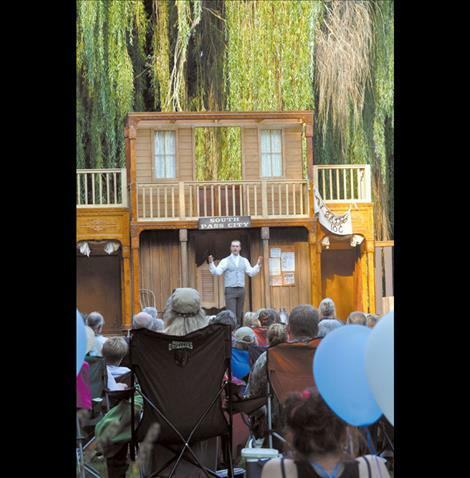 RONAN – A westernized Montana-based version of a timeless classic had folks in stitches of giggles as golden sunlight swept through the willows of Palmer Park in Charlo, painting a serene scene of community jolliness while Shakespeare in the Park unfolded on Aug. 16. 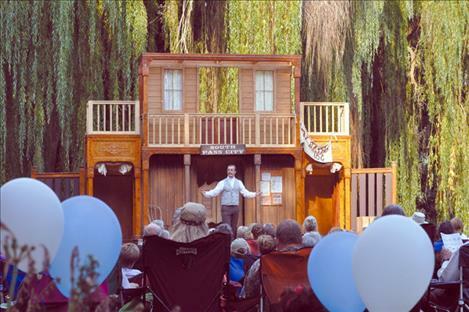 Shakespeare in the Park is a unit of Montana State University in Bozeman that brings two free theatrical productions to parks across Montana during the summer. 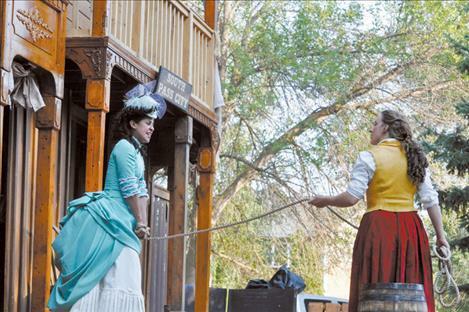 This year’s show in Charlo was “The Taming of The Shrew,” adapted to bring the 1593 comedy up-to-date with a Montana spin. 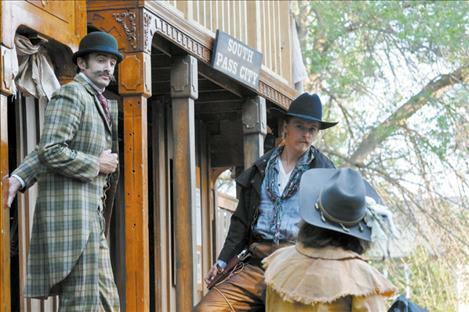 The crowd laughed as the show began with what appeared to be a town drunkard staggering toward a saloon in the fictional South Pass City, Montana. 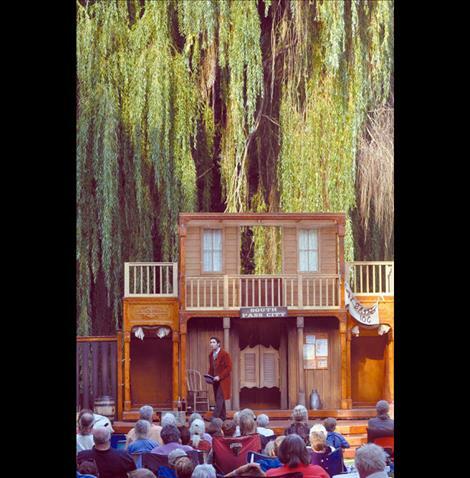 The drunkard’s act seemed very real. 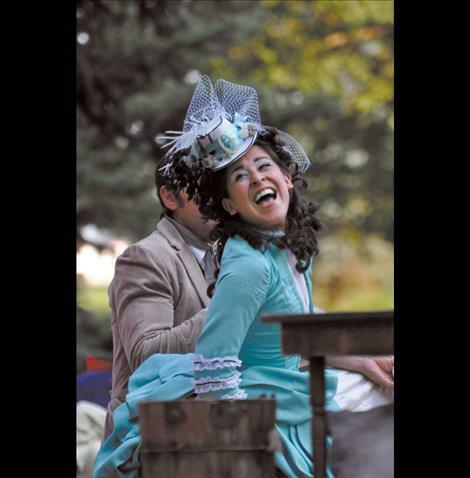 “It was convincing,” Palmer Park owner Sue Palmer said, adding that she thought she and husband Skip were going to have to kick the actor out of the show, until she realized he was not a member of the crowd. 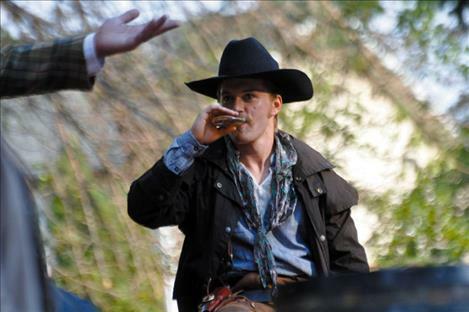 The drunkard entered the stage muttering about a woman over in Ronan, which earned laughs from the crowd. 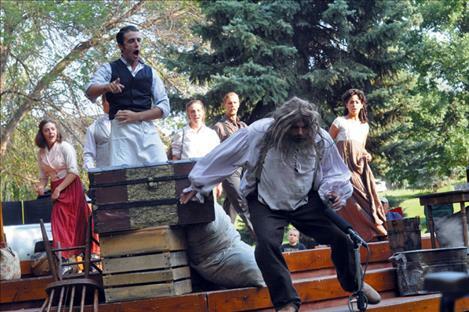 The entire story referenced places in Montana and Wyoming to adapt the Bard’s Padua, Italy-based play. 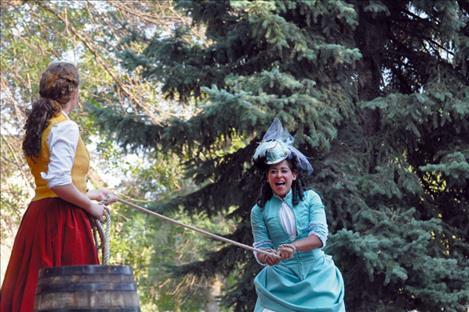 The hilarious show starred Erika Haaland and Andrea San Miguel as dueling sisters Katharina and Bianca. Bianca has found her soulmate Lucentio, but she cannot get married until her older sister Katharina is wed. The only hiccup is that Katharina has a horrible personality and often scares men away by being unkind to them and sometimes going so far as breaking guitars over their heads. 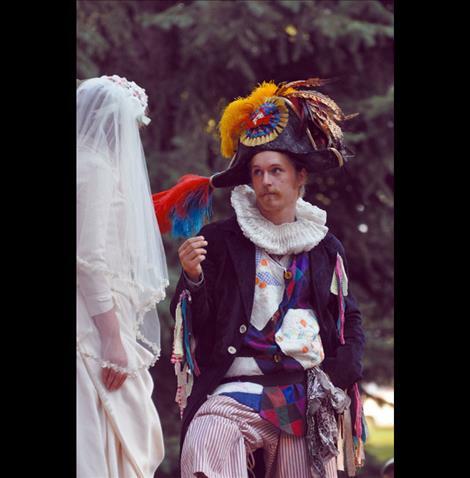 Lucentio hatches a plan to have suitor Petruchio win Katharina’s heart. 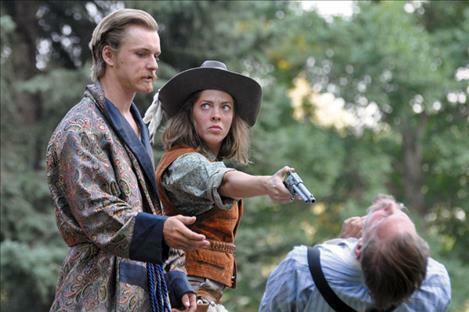 Petruchio is a gentleman more interested in Katharina’s dowry than her personality, but he sees her hardheadedness as attractive and eventually, through a myriad of schemes, he cracks her cold heart and tames the shrew. Ronan resident Giles Gordan said he enjoyed the show. “It’s just a great community event,” Gordan said. 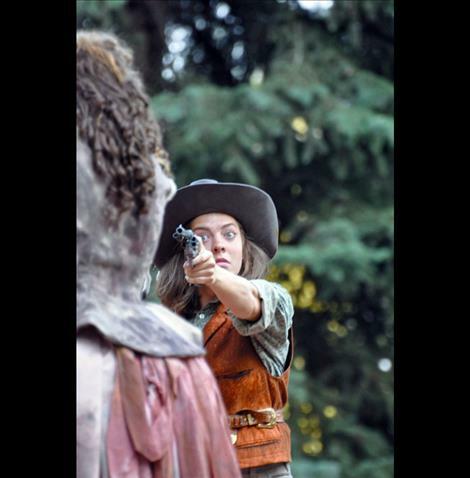 Hailey Schippers has been volunteering at the event since 2007, because her mother is part of the Ninepipes Arts Group that helps sponsor the event.